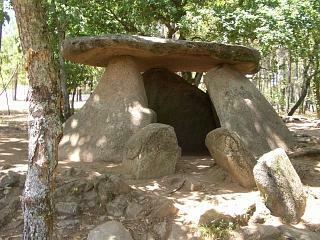 The Dolmen of Axeitos is one of the best examples of a pre-history monument in Galicia. It is located just off the AC550 coastal highway between Noia and Ribeira and is very close to the Corrubedo beach, dune and National Park complex, in la Coruna province. 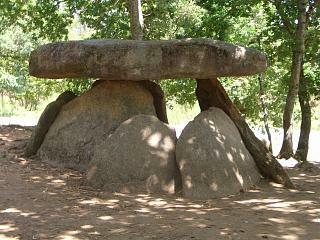 Right, the ancient Dolmen of Axeitos. The Dolmen of Axeitos is approximately 6000 years old and is now set in a park area which, whilst poorly signed, once found has a car park and descent sized picnic area. Dolmens are of course nothing but a small collection of very large stones looking something akin to a giant stone table. They were the burial spots of what are assumed to be important warriors and local tribal leaders from thousands of years ago. Left, another view of the Dolmen. Artefacts have been found at some of the dolmens and more of these ancient monuments are been discovered and uncovered on a regular basis. Look out for signs directing you to them whilst you travel around. Dolmens like castros are an acquired taste. If you find history and particularly ancient history fascinating, this is one of the best examples of a dolmen you are likely to encounter. 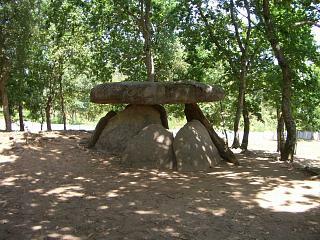 Dolmens, whilst not unique to Galicia, do appear all over the region and more are being discovered on a regular basis. Right, yet another shot from a different angle.